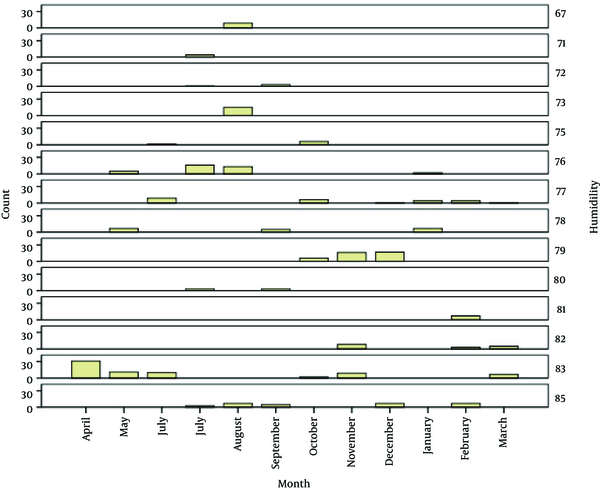 To Cite: Nasiri M, Jannat Alipoor Z, Jahanshahi M, Abrotan S, Fotoukian H. The Association Between Acute Myocardial Infarction with Seasonal Variations and Admission Time, Crit Care Nurs J. 2017 ; 10(3):e12313. doi: 10.5812/ccn.12313. Background: There are contradictory results regarding the pattern of seasonal variations of acute myocardial infarction (MI). Documentation of such a pattern may contribute to identify new pathophysiological factors in the occurrence of MI. Therefore, the current study aimed at determining the association between MI and the admission season and time. Methods: The current cross sectional, retrospective study was conducted on 286 patients diagnosed with MI admitted to Imam Sajjad (a.s) hospital in Ramsar, Iran, in a 5-year period from 01 July, 2012 to 31 July, 2016. Data of patients including age, gender, and admission hours, months, and seasons were collected from their records. Information on temperature and humidity was collected from Ramsar weather forecast center (Iran). Data analysis was done by SPSS version 18 through statistical tests. Results: The mean age of the study subjects was 68.12 ± 6.44 years. The highest admission rate was in summer (30.1%) in terms of season, and it was 35% at 12:00 P.M to 6:00 P.M in terms of time. Admission peak hours were at 10:00 AM, 11:00 AM, 1:00 P.M, and 2:00 P.M, respectively. There was significant statistical difference between MI in terms of season, and temperature and humidity average (P < 0.00). Conclusions: There was a seasonal rhythm in admissions for acute MI in the study with an increase in summer and a decrease in winter. In most of the studies regarding the effect of seasonal variations on the occurrence of acute MI, only the effect of temperature was studied. Due to the relationship between humidity and the occurrence of acute MI in the current study, it is recommended to conduct further studies by considering the 2 variables. Based on the progress of science and technology in the current industrialized world, contagious diseases are controlled nowadays, but non-contagious diseases, most notably cardiovascular diseases, are among the most basic health problems (1-3). Cardiovascular disease is the most common cause of deaths among females and males in the developed countries (4); it is the cause of 12.8% of all the deaths (5), almost 83 million people have cardiovascular diseases in America (6). Cardiovascular diseases are also recognized as the most important causes of death in Iran; the study of death face in 18 cities of Iran showed that 46% of all the deaths were due to such diseases (3). Angina pectoris and myocardial infarction (MI) are the most important cardiovascular diseases. In Iran, MI was common within the age range of 40 to 70 years in the last years, but it decreased to the age range of 20 to 60 years in the recent years (7). There is evidence that this disease is increasing with the growing trend of 20% to 45% (8). Several factors are reported regarding the occurrence of this disease in the epidemiological studies. Family history, aging, gender, and race are reported as the non-modifiable factors and fat gain, smoking and tobacco use, high blood pressure, diabetes, metabolic syndromes, obesity, and physical inactivity are reported as the modifiable factors (9). Results of the studies in the recent decade showed that behavioral factors such as lack of physical activity and poor diet are among the most important factors (10). In some other studies, in addition to the abovementioned effective factors, geographic regions, seasons, and also different hours of a day were recognized as the risk factors. Different statistics regarding death prevalence in many countries and cities in different seasons and hours also confirmed this issue (11-14). In epidemiological studies, in a 24-hour rhythm of vascular events such as angina pectoris, MI, stroke, and arrhythmia, the cardiac arrest had the highest prevalence from 6 A.M to 12 P.M. Morning peak mechanisms in cardiovascular events is considered to be dependent on body behavioral changes such as status change from supine to standing, waking behaviors, and finally changes in the body’s biological clock. Researchers believe that heart rates, blood pressure, central nervous system (CNS) activity, and platelets function are attributed to changes in body’s biological clock (6). Human biological and behavioral changes during a day are controlled by suprachiasmatic nucleus located on the front of hypothalamus; suprachiasmatic nucleus is also called central pacemaker (15), which is controlling cardiovascular function, hormones, blood volume, blood pressure, etc., and there is a close relationship between the changes in sleep-wake patterns and nucleus performance (6). The lowest blood pressure is usually at night, which is going to rise before wakening; it can increase cardiac arrest among the subjects with cardiac disease (15). Therefore, hormonal, neurological, and behavioral changes in a 24-hour rhythm are among the effective factors in cardiovascular events (4). Strong evidence from animal models and epidemiological studies indicated that the body’s biological clock dysfunction is significantly a risk factor for cardiovascular events (10), but the main cause is not clear yet (4, 16). Another controversial variable in cardiac arrest is temperature changes in different seasons, since human body is influenced by the environment temperature under any conditions. In the high temperature, the body is encountering metabolic wastes and sometimes droughty breathing in some cases; body is weakened in the case of impairment in temperature exchange, and consequently, cardiac activity increases, which leads to heart palpitations and as a result the heart weakens step by step; warm environment and vasodilatation increase blood flow under the skin and some problems are going to rise with perspiration and excretion of excess sodium, which can be dangerous for the heart (17). However, the role of season in the prevalence of MI and blood pressure is not well recognized (18). Researchers of environmental health researches center in Germany (in Munich) assessed 1000 patients; they found that cold weather contributes to increased occurrence of MI by increasing body’s inflammatory markers (7). Results of the study by Spencer et al. showed that MI mostly occurred in winter, fall, spring and summer, respectively (19). Also, in the studies conducted in Britain, India, and Australia, MI was reported mostly in winter (20, 21). In a study, cardiac attack rate in winter was 53% more than that of summer (19), and in another study, the highest and lowest rates of MI were in January and July, respectively. Results of another study showed that (22) the highest rate of MI was from January to March (23). Marchant et al., observed that 30.5% of all the cardiovascular events occurred from December to February (11). The ambient temperature was 0°C or below 7°C in some studied countries such as Russia (Yekaterinburg city) (24). Coronary stent thrombosis was reported more in the summer months in a study (25); some studies indicated that MI occurred as the result of increased ambient temperature (16); some other researchers did not observe significant relationship between the ambient temperature and MI (23, 26). A study in Tasmania showed a significant relationship between the maximum and minimum ambient temperatures and MI (19); in other words, thermal stresses below 10°C and above 26°C are effective in increasing cardiovascular events. Increased respiratory infections (27) in the cold months, increased low-density lipoprotein (LDL) level (28), sympathetic activity, blood pressure, and platelets function in the warm months provide the situation for cardiovascular events (27). There are several risk factors involved in MI; some of these risk factors such as climate change are less considered. It seems necessary to be aware of all the risk factors. One of the strategies outlined regarding prevention of MI is identifying all the risk factors and educating patients about modifying or controlling the risk factors. Nurses are among the people who have the closest relationship with the patients at different health levels and they can have an important role in discovering risk factors and educating patients. Since Ramsar, Iran, is a tourist town located 20 meters below sea surface with a relatively mild and wet weather, without the complications of industrialized cities, the current study aimed at evaluating the effect of climate factors on the prevalence of cardiovascular events based on Ramsar climatic changes. 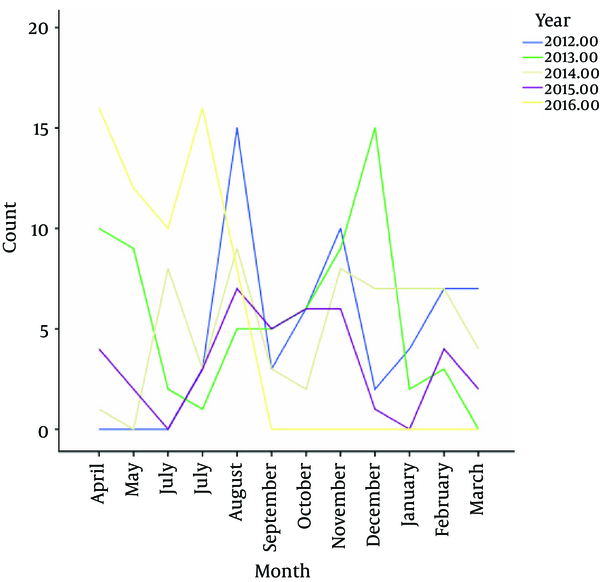 The current study aimed at exploring the association between occurrence of acute MI and seasonal variations and admission time. It was a cross sectional, retrospective study. Census method was used for sampling and all patients with a diagnosis of MI hospitalized in cardiac care unit of Imam Sajjad (a.s) Hospital in Ramsar from 01 July, 2012 to 31 July, 2016 were selected as study population including 286 patients. After obtaining permission from the relevant authorities, the researcher referred to the cardiac care unit (CCU) and patients’ data including age, gender, type of MI, admission time, month and season of MI occurrence were recorded based on their medical history. Also, the temperature and humidity data of Ramsar from 01 July, 2012 to 31 July, 2016 were recorded by referring to the local weather forecasting center. Data analysis was done using Chi-square, the Kruskal-Wallis, the Mann Whitney, and linear regression statistical tests by SPSS version 18. The current study was conducted on 286 patients with MI during 5 years; the mean and standard deviation of patients’ age was 68.12 ± 6.44 years, 73% (n = 210) of the subjects were male and 27% (76 patients) female. The highest rate of MI was 27.3% (n = 78) within the age range of 50 to 60 years and the highest number of admission was observed in August, 2012, 2014, 2015 and in December 2013; totally, the number of admission in summer, spring, fall, and winter were 30.1% (n = 86), 25.9% (n = 74), 24.8% (n = 71), and 19.2% (n = 55), respectively. Figure 1 shows MI frequency distribution based on month and year. The inferior type of MI was 57%, Escherichia coli septal and anterior 15.2% each, posterior 1.6%, accent 5.9%, anterolateral 5.1%; also 14% were hospitalized in the first 6 hours of the day (00:00 to 6:00 A.M), 31% in the second 6 hours (6:00 A.M to 12:00 PM), 35% in the third 6 hours (12:00 P.M to 6:00 P.M) and 20% in the fourth 6 hours (6:00 P.M to 12:00 A.M). The admission peak hours were 10;00 AM, 11:00 AM, 1:00 P.M, and 2:00 P.M, respectively. 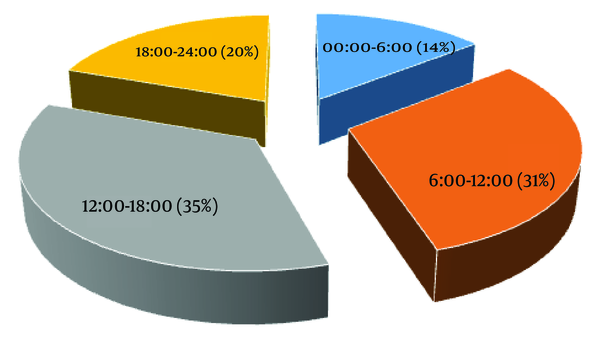 Figure 2 shows the frequency distribution based on admission hours. There was no significant difference between season, gender, and age variables through the Chi-square test. The highest rate of MI in males was in summer (n = 58) and fall (n = 54), respectively and also in female in summer (n = 17) and fall (n = 17). The highest rate of MI in winter, fall, and spring was within the age range of 50 to 60 years and in summer within the age range of 40 to 60 years. There was no significant relationship between gender, and humidity and temperature levels by the Mann-Whitney test. Assessing the frequency distribution of MI, there was no significant relationship between age, gender, and admission time. In both genders and age groups, the highest admission time was from 6:00 A.M to 6:00 P.M. According to the results, the highest rate of MI occurred at above 25°C and above 70% humidity. There was a significant difference between season and the means of temperature and humidity by the Kruskal-Wallis test (both P < 0.00), but the difference was not significant with that of the admission time. Also, there was no significant difference between age and ambient temperature and humidity. 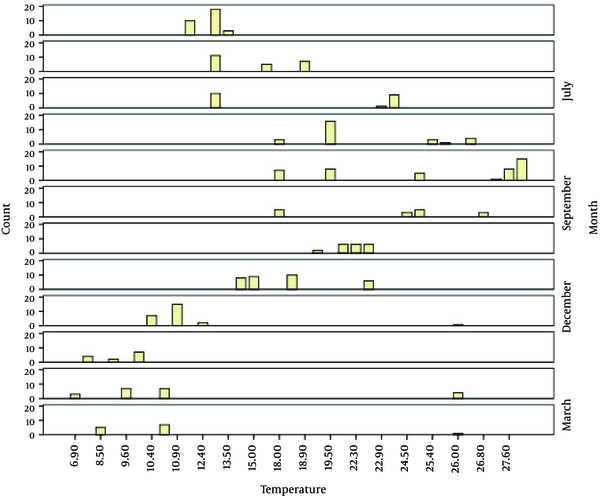 Table 1 shows the determinant factors of MI in different seasons by the multiple regression model, based on the temperature and humidity; the temperature and humidity levels were the determinant factors. 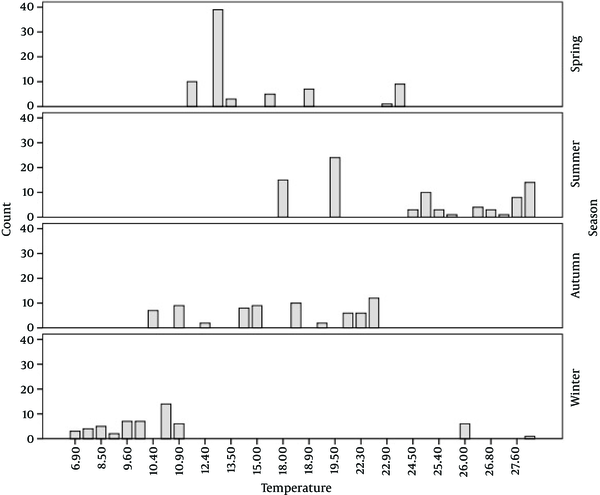 Figure 3 shows the frequency distribution of MI to the breakdown of season and temperature and Figures 4 and 5 show the frequency distribution of MI to the breakdown of month, temperature, and humidity. The current study showed that the number of MIs based on the season was attributed to summer, spring, fall, and finally winter, respectively. Also, in the studies by Heyer and Kloner, MI was more in the warm season (16, 21), but in most of the studies, MI was observed in winter. Xu et al., in a study conducted in China reported that 30% to 50% of MIs occurred in winter (12); the studies by Spencer in America (19), Daei in Qazvin, Iran (13), Jahanbakhsh in Ahar, Iran, (7) and Oranto et al., (29) also indicated that MI mostly occurred in winter. Marchant et al., believed that ambient temperature had an important role in the acute MI pathogenesis (11). Some researchers believe that seasonal patterns are counted as a main factor in thermal stresses; also, they totally believe that the increased number of admissions is related to the very cold and very hot seasons. Although thermal stresses in different seasons have an important role in MI, it cannot be considered as a main factor, and always considered as a contributing factor (11). There are many studies that only considered temperature and there is nothing reported about humidity, which is along with increased sweating and its’ associated problems, or the studied cities such as Ahar and Qazvin are not humid. One of the causes of the differences in the results of the present study with those of the other studies is probably due to the humidity variable. Ramsar is a coastal town; it has a high humidity level and is not very cold. Most admissions in the present study were from 6:00 A.M to 6:00 P.M; the peak hours were 10:00 AM. 11:00 AM, 1:00 PM, 2:00 PM, respectively. In the study by Peal and Alouzo, the heart attacks peak were mostly in mornings (30); in the study by Jia et al., the first heart attack peak was reported from 7:30 to 8:30 A.M., the second peak from 2:30 to 3:30P.M, and the third peak from 11:30 to 3:00P.M (14). In the study by Shea et al., the initial heart attack peak was from 6:00 A.M to 12:00 P.M, the second peak from 6:00 P.M to 10:00 P.M, and the least heart attack peak was from 12:00 to 6:00 A.M (31). In many epidemiologic studies in a 24-hour rhythm, the highest cardiac arrest was from 6:00 to 12:00 (6). It should be considered that the present study was a retrospective survey and there was no access to the patients and the admission time peak was calculated in CCU; it is likely that from the beginning of cardiac arrest to referring to the hospital and hospitalization was taken 3 to 4 hours; therefore, it can be expected that the attack peak was 3 to 4 hours prior to hospitalization. The results of the present study were almost consistent with the results of many other studies. Myocardial infarction occurred in males more than females in all seasons in the present study; also in the study by Isfahani et al., the number of the reported MIs was 106 in females and 207 in males. There was no significant difference between age and gender with seasonal patterns similar to the present study and those of the studies by Isik et al., and Girber et al. (5, 8, 24). In the study by Gerber et al., the prevalence of MI was 43% in females with the mean age of 68.14 years; in the study by Jia et al., among 1467 patients, 1159 were male and 308 female with the mean age of 65 years (14, 24). In terms of MI prevalence in Iran, the mean age was less than those of the abovementioned studies, and in terms of gender, it was almost similar to those of other studies. Similar to other countries, cardiovascular events are high in Iran, but the mean age is lower in Iran; therefore, all the effective factors and the coping strategies with MI should be identified. As the current study was a retrospective survey with limited variables, by assessing the results of the study, it seems that there were some other effective factors in addition to the main effective factors, which can be pointed to the seasonal, climate, and humidity changes. Identifying climate and environmental risk factors, which their effects on diseases are proved, can be effective in maintaining, promoting, and preventing health problems. Therefore, for better identification of the effective factors in every region, it is necessary to conduct such studies. Necessary warnings, and appropriate and essential educations should be provided for the patients due to the effect of the weather conditions and climate factors on diseases; nurses can play an important role in this regard. Based on the climate conditions of the region and MI seasonal and time peak, health system should be more prepared for the admission, treatment, and support such patients. It is recommended to make some policies, such as increasing the number of experienced nursing staff in the emergency wards and intensive care units (ICUs), and more preparation of the cardiopulmonary resuscitation (CPR) team to provide high quality nursing cares and decrease MI inappropriate outcomes. Authors wish to thank the head nurse and staff in the CCU of Imam Sajjad (a.s) hospital in Ramsar, Iran, and also the director and staff in the weather bureau of Ramsar who helped with the current study. Authors’ Contribution: Mahboobeh Nasiri, Study design, data analysis, and interpretation of data; Zahra Jannat Alipoor, Study design, data collection, critically revision of the manuscript, supervising the study process, drafting and submitting the manuscript; Mehri Jahanshahi, Data collection; Hallima Fotoukian, Data collection; Saeed Abrotan, Study design and supervising the study process; all authors read and approved the final manuscript.